It is probable that a significant number of people with mental disorders are not identified. This can be due to time and resource constraints and relatively low priority placed on patients with minimal functional impairment, especially if they have more urgent medical problems. On the other hand, many people with a diagnosis of depression will be prescribed antidepressants when psychological therapy alone would have been effective treatment. Adjunctive psychological therapy with antidepressants is often neglected due to lack of available services, cost or time constraints. Mental disorders are very common in the New Zealand population. A survey conducted between 2003 and 2004, in 13,000 people aged 16 years and over, identified a 40% self-reported lifetime prevalence of a mental disorder. Overall, anxiety disorders were the most frequently reported (lifetime prevalence rate of 25%), followed by depression and other mood disorders (20%) and substance use disorders -predominantly alcohol (12%). Other New Zealand studies have shown that half or more of all people who develop a serious mental disorder had experienced the disorder by age 18 years. However, a first episode of depression can occur at any time of life with about a quarter of first episodes reported in people aged 50 years and older. Women have a higher lifetime prevalence rate of disorder than men, particularly major depressive disorder. New Zealand research has also shown that people with mental disorders do use primary care services although they may not present with these as their main problem. Primary care is well placed to provide effective management of these treatable disorders. The primary care sector is the logical place for the delivery of mental health care to Māori, Pacific Peoples and other ethnic groups. It offers better prospects for early intervention and the management of comorbidities. The cause of depression is multifactorial and complex. It involves the interaction of individual vulnerability with exposure to stressors. Genetic, developmental, nutritional, endocrine, psychosocial and life stress factors can all contribute. This complexity may explain the wide variation in clinical presentation and response to treatment. A number of risk factors (vulnerability) and resilience factors (protective) have been described (Table 2). For example, a history of depression in one or both parents puts their children at a three-fold increased risk of depression, whereas good parenting (emotional warmth, cognitive stimulation) is viewed as protective in the presence of risk factors. These concepts fit well in to the “stress vulnerability model” whereby stressful situations may trigger depression in susceptible (vulnerable) people, but not in others who display protective traits or resilience. The concept of resilience was once considered to be a personal trait but is now viewed as more of dynamic development process which can be used as part of intervention and prevention programs. Although depression can present spontaneously, there is usually an underlying factor such as work stress, job loss, grief or relationship breakdown that can precipitate depression, especially if the person is vulnerable and has low resilience. Alcohol, cannabis and other recreational drug use are all associated with depression. Although low socioeconomic status alone does not appear to be predictive for development of depression, people in low socio-economic groups may be less likely to access services and receive effective treatment. Antidepressants are a mainstay of the treatment of moderate to severe depression (see Pharmacological Management of Depression in Adults). In this analysis of prescribing data (Figure 1) we have looked at the SSRIs (Selective Serotonin Reuptake Inhibitors) and venlafaxine but not TCAs (Tricyclic Antidepressants) as data for the latter are confounded by their significant use for other indications such as pain. 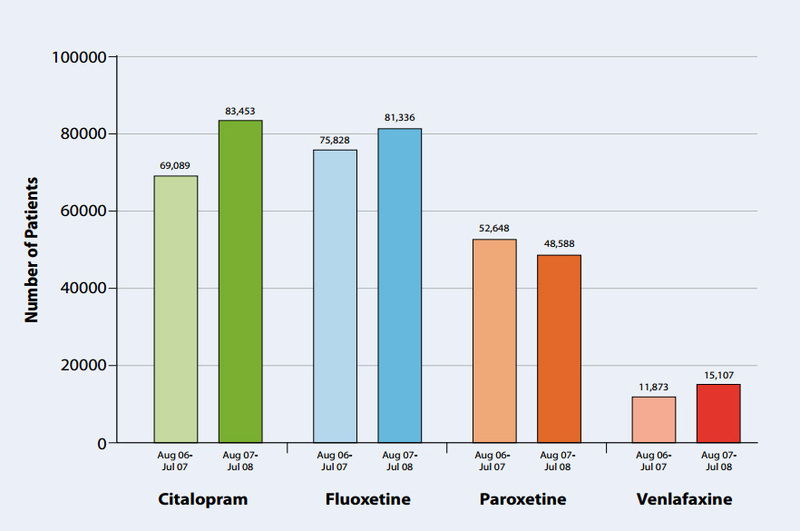 This analysis estimates the number of patients using one of the available SSRIs or venlafaxine. Two consecutive 12 month periods have been considered (August 2006 to July 2007 and August 2007 to July 2008). The volume of venlafaxine prescribing is influenced by its special authority status and the current restrictions on its use. However, venlafaxine use has been steadily increasing over the last two years since vocationally trained general practitioners were given authority to prescribe it. The data are not exclusive for the treatment of depression. The number of patients has been estimated over the two consecutive twelve month periods analysed. At a national level citalopram and fluoxetine are the most commonly used SSRIs whilst paroxetine appears to be the least favoured SSRI. Although all SSRIs are generally accepted to be similar in effectiveness, certain SSRIs may be preferred in specific patient groups. Paroxetine has not been shown to be effective in adolescents and is linked with a higher rate of suicidal ideation. Fluoxetine is the preferred SSRI for adolescents although this is not a licensed indication in New Zealand. In the elderly, citalopram may be preferred due to its lower potential for interactions. Paroxetine should be avoided in pregnancy because of reported higher rates of congenital malformations.